I'm a big fan of Joel Spolsky's writing, so when his software company hired interns for the summer and made a documentary movie about it, I ordered it immediately. There aren't a lot of good computer-geek movies based in reality, so I'll give anything a chance, even if it has an awkward name to spell and pronounce. I was part of the first preorder wave, so I received my copy today and enjoyed the hour-long documentary. Aardvark'd isn't as dramatic as Pirates of Silicon Valley nor as comprehensive as Triumph of the Nerds, but it's an unusually realistic and down-to-earth portrayal of a real software company making a real product that sells in the real world. 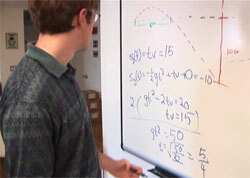 For the die-hard Joel On Software community, much of the interview material with Joel isn't new. Any fans devoted enough to read every post and listen to every audio interview will recognize much of what Joel says as recent content (much from clips that were given away in the trailer last month), but that doesn't diminish its relevance or effectiveness. The guest appearances were pleasant surprises. You're just watching a bunch of unknown young programmers, then boom! There's Dan Bricklin, creator of the spreadsheet. Paul Graham also made many insightful appearances, although his introductory scene had me wondering exactly what it had to do with the movie and why it was placed at that point. It doesn't really matter, of course - he still had interesting things to say while we watched him make chili. The production quality, given their constraints, was excellent. Some scenes were poorly lit or framed, some audio levels needed normalization or compression, and viewers have to watch a lot of autofocusing. But with the professional HDV camera they used, there was a lot of room for error and the final DVD turned out quite well. When the DVD was announced, I was disappointed that a full-resolution HD version wasn't available, but now I agree that DVD resolution is sufficient. Nobody's watching Aardvark'd for the special effects. One interesting facet of development revealed by the movie was the cost of everything in the real world. We young people always underestimate the cost of running businesses. "Sure, I can charge only $30 while the big evil corporation charges $100! They're sure ripping everyone off. What are you talking about? ...no, I don't have to pay for insurance or worker's comp or legal fees or distribution or HR or advertising or office space." 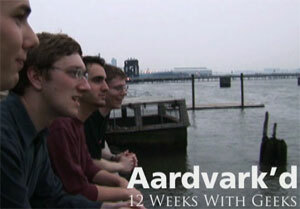 Overall, Aardvark'd was a lighthearted, amusing, and interesting documentary on jumping between buildings, growing tomatoes in Manhattan, and occasionally developing software. This probably isn't a movie to force your nontechnical girlfriend to watch with you, but it's definitely worth the $20 and an hour of your time. Hey, for at least one night, you can watch something other than Law & Order reruns.